A while back I picked up a 5-pack of Sharpie oil-based paint markers, wanting to experiment with the medium a little bit, and then (like so many such purchases) I totally didn’t make the time. We were talking on Twitter last night about the issue of buying supplies for new media and it inspired me to pull out some blank Moleskine Volants (a blue 2-pack) and play around. I have a few pieces of dishware from Japan with dragonflies on them, and I’ve always found them fascinating, maybe because we didn’t really have them where I grew up. I have a really limited palette here, so I just toyed around with the various possible color combinations on the three big guys, then added in the little guys for some extra interest. The notebook in this case is a really dark blue that’s nearly black, so it provided a dramatic backdrop for the bright primary dragonflies. 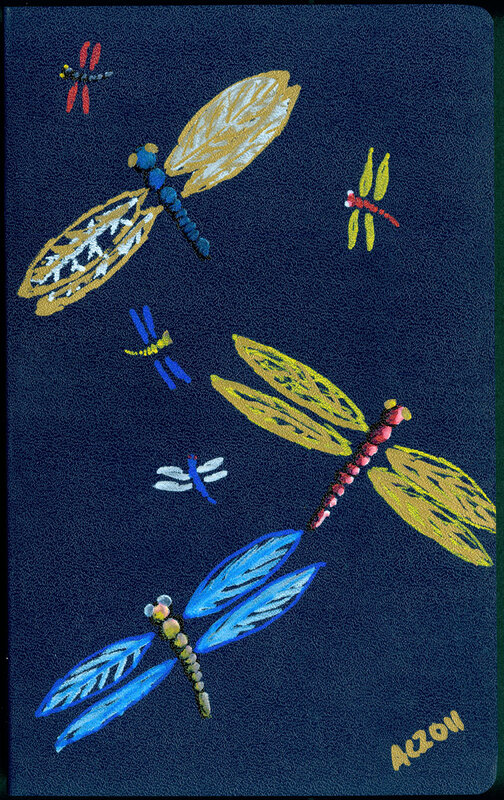 Dragonflies, 5″x8.25″ Sharpie oil markers on a 96-page blank Moleskine Volant, nfs (sold).